There was never an "us". I've also wondered why Steph (Sarah) had to say this to Tonio (Coco). When Star Cinema's trailer of Maybe This Time plays, Sarah Geronimo as Steph says "Sometimes, having no closure is a closure". Having to deal with ex's in our lives will get us rush to theaters (starting tomorrow) and learn more about what could still be the possibility of our own relationships. These were my thoughts before the bloggers conference today at Star Cinema attended by Drama King Coco Martin, Box Office Queen Sarah Geronimo, Direk Jerry Lopez Sineneng, Creative Director Ms. Vanessa Valdes, Ms. Melai Monghe and Anton Santamaria. The cast with the creative team of Maybe This Time discussed how Tonio was more of Coco Martin and how Sarah was quite different and similar to Steph. Ms. Vanessa Valdes shared how Coco Martin was all-willing and all-trusting giving his weaknesses shared to the public as Tonio to make the story come out as they've expected. Coco had confidently and completely accepted his speech problems (lisping), styling weaknesses and his vulnerabilities as a man like Tonio (Anton Santamaria). Direk Jerry Lopez Sineneng was so convinced the moment the camera showed the two from the first shooting day. The team felt the perfect "chemistry" the two actors gave to show the real characters they portrayed. Deviating from the teeny, cutie Laida is Sarah as Steph who will have issues with her family compared to the usual family we see in her previous movies. 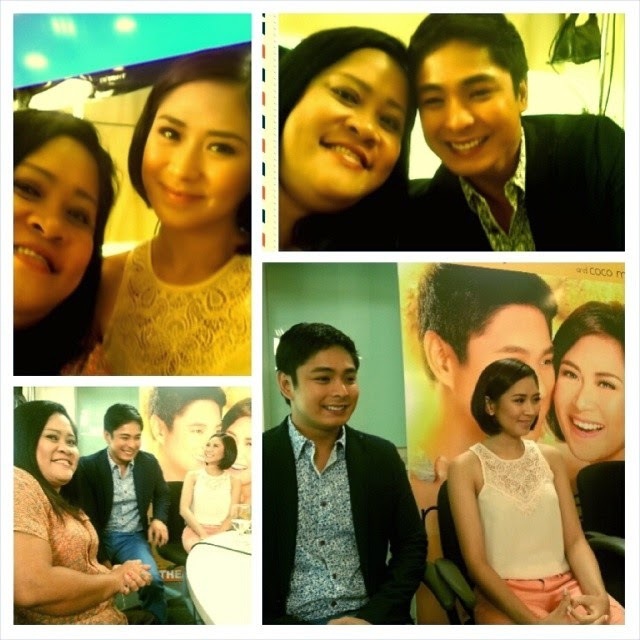 Coco Martin learned from Sarah Geronimo at every scene and learned more about the story from the bloggers conference today. He was at awe at Ms. Vanessa Valdes explaining to bloggers the difference of complex from complicated love. In between the giggles of the cast and the bloggers who shared laughter at host EJ Salut and Direk Jerry Lopez Sineneng's comments about the type of efforts given by the actors during the shooting, I couldn't help but notice how Sarah looked alike Coco and how the two will disagree at some points in a discourse beyond comprehension. It was a type of chemistry that's new to all of us and it was refreshing and delightful. Will this movie earn Sarah a different homegrown name again? The cast, the creative team and the bloggers are also excited why Tonio fell for Monica (Ruffa Gutierrez). What was special about the confrontation scene of Sarah and Coco? Star Cinema on its on-going 20th anniversary in collaboration with Viva Films brings Maybe This Time with Primetime King Coco Martin, Box-Office Queen Sarah Geronimo and Ruffa Gutierrez in a movie about second chances, closures and what type of romance we are all going through (or in many cases gone through) these days. The movie also stars Ogie Diaz, Dennis Padilla, Mariann Flores, Zeppi Borromeo, Garlic Garcia, Minnie Aguilar, Boboy Garovillo and Sharmaine Buencamino. It opens in more than 150 cinemas nationwide starting tomorrow May 28, 2014! I'm definitely watching it tomorrow! For more information, please visit http://starcinema.abs-cbn.com/ and follow @starcinema on Twitter and Instagram for more updates.